Nearly 3 weeks into its planned 4-week run, an electronic billboard honoring first responders in the Gaza Strip was pulled on November 13th when the billboard company received phone calls and email complaints labeling their staff as terrorists and anti-Semites, and threatening a boycott. The Palestine Advocacy Project sponsored the billboard on Interstate 93, near Boston, Massachusetts, USA, to highlight the desperate situation in the Gaza Strip, and to emphasize the humanity and agency of the people of Gaza, who are often portrayed as terrorists or victims. 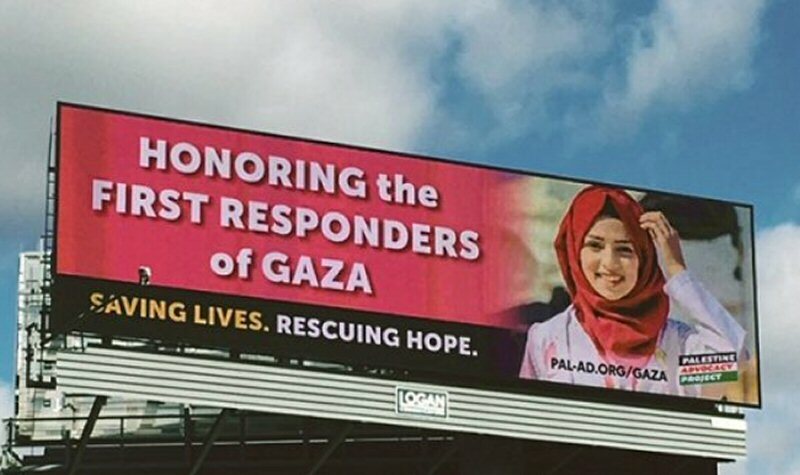 The billboard included a photo of deceased Palestinian medic Razan al-Najjar, and text reading: “Honoring the First Responders of Gaza. Saving Lives. Rescuing Hope.” It was estimated to be viewed by over a half million motorists each week of its planned 4-week run, beginning 24 October. The billboard was met with positive media coverage. The billboard is another casualty in an ongoing attack on free speech. Palestine Legal states in their 2017 report, “The Israeli state and its proxy organizations in the U.S. are investing heavily in punitive measures to intimidate and chill the free speech of those who wish to express criticism of Israeli policies.” The report documents 308 attacks on U.S.-based Palestine-related free speech in 2017 alone, according to the PNN.